As you might have guessed, a lot of progress at school is accomplished with the use of a child’s eyes. Yet interestingly, in spite of this well-known link between vision and learning, a lot of parents underestimate or are perhaps unaware of the significance of vision problems, and as a result, don’t get their child’s eyes checked regularly. 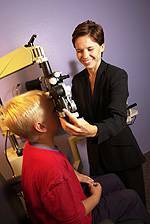 It’s important to know that because vision in kids changes, regular eye exams are necessary for success at school. As children go through school, it becomes extra important to keep an eye on their eyesight. Not being able to meet the visual requirements of the classroom and school work can noticeably affect their academic performance. Recently developed educational technology, such as interactive whiteboards, can even heighten previously hidden vision issues. Without adequate vision, students may suffer not only in the classroom, but also mentally, physically and emotionally. If your child has already been tested for and fitted with glasses, now is a perfect time to see if they need new glasses. If you want a child to wear his glasses, he better like how he feels in them! Make sure you make time to make an appointment to see us when you’re getting your kids ready for their year. We’ll do our very best to help all the children we treat commence the new school year with their vision in check.